Last night some friends and I had an interesting dining experience in Stockholm. We went to a place called Svartklubb – which translates as ‘black club’ and is also the Swedish word for a speak-easy. The name of the place is a clever play on words, because the entire dining room is actually plunged into darkness, and the waiting staff are blind. The purpose of the restaurant is to provide guests with the experience of how it is to be without sight. And it’s an interesting, and humbling, way to spend a few hours. The dining room was pitch black, you were guided through the darkness to your seat, you couldn’t see your hand in front of your own face. An unknown three-course meal (delicious) and drinks were served to you and you had to navigate the use of cutlery and glassware without spilling on yourself, smashing glasses or spraying your neighbours. You had no idea what your environment looked like, what the other diners on the next table looked like or even how far away you were sitting from each other. The thing that I found most disturbing was the noise level in the room. When sight is removed, our other senses increase, and to me it felt like people were screaming and shouting. This was a surprising insight into how it must be for blind people on a daily basis. Once out of the dining room, as my eyes adjusted to the dim light in the bar, a sense of relief swept over me. At last my sight was back. And again the realization hit me that, for blind people, their sight doesn’t come back. What we just experienced for a short time is the reality for them 24-7. It certainly gave me a sense of reverence. In Sweden, there are approximately 100,000 people registered as blind or visually impaired. According to the WHO, there are 253 million people globally who are visually impaired – 36 million people of them who are fully blind. That number will increase to 115 million people by 2050. The majority of these are in developing countries, and the tragedy is that roughly 75% of blindness could be prevented or cured with a simple operation. If you are interested in trying out Svartklubben, you can book a table at http://www.svartklubben.com or via Ticketmaster. 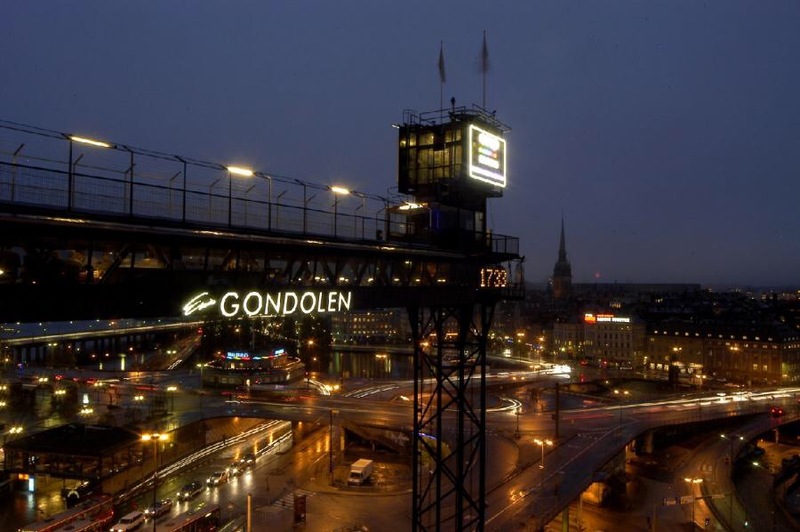 If you want to experience a breathtaking view of Stockholm, while enjoying a fantastic cocktail or meal, very little beats Gondolen. Perched 33 meters above Slussen in a glass tongue, the restaurant serves critically acclaimed food and offers sweeping vistas of the lake Mälaren to the left, the city and the Baltic Sea to the right. Gondolen is a perfect location in the winter months, when the cold winds and icy temperatures envelop Stockholm. From inside, you can look out over the glittering winterscape while sipping on an elegant Rasperritini and tucking into a bleak roe toast. The restaurant has historical merit, as it was inaugurated in 1935 as part of an inner city generation project. And history tends to repeat itself. The area where Gondolen is positioned is being heavily renovated again with a lot of demolition and remodelling. However, I believe this Stockholm classic will remain a jewel in the city’s crown for many many years to come.